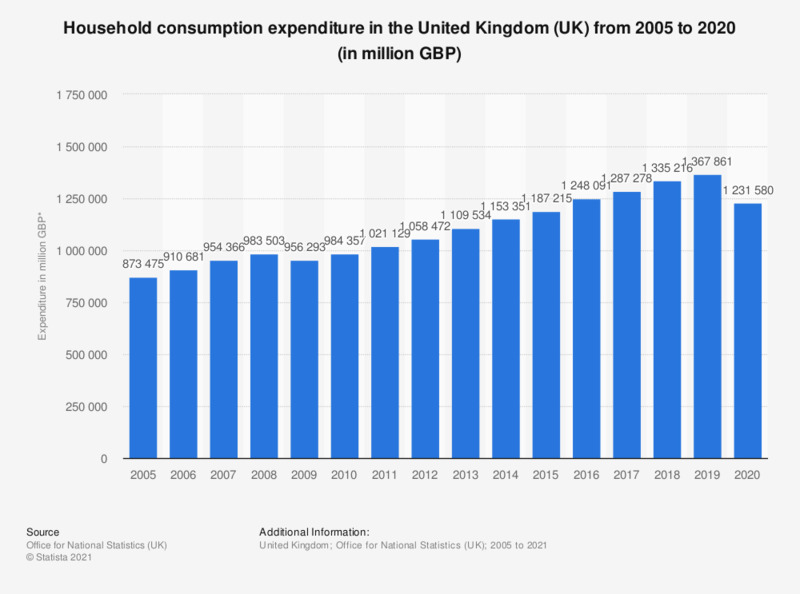 This statistic shows total domestic consumption expenditure in the United Kingdom (UK) from 2005 to 2017. Over this period, consumer spending in the UK increased, reaching approximately over 1.27 trillion British pounds in 2017. Household consumption expenditure looks at the overall spending on consumer goods and services of a wide variety. Some examples are government licenses and permits, such as a passport renewal or the price of train tickets to get to work. Housing may also be accounted for in these figures. This figure is measured by how much the consumer actually pays at the point of sale. All fast moving consumer goods such a beer, or cigarettes are also accounted for in this data. One part of the United Kingdom, Scotland, has seen as increase in its overall household expenditure year over year since 2009, with figures reaching almost 96 billion British pounds in 2016. There was a small decrease in expenditure in 2009, which was possibly a result of the economic recession which hit all of the United Kingdom hard at this time. This drop can also be seen when looking at the whole of the United Kingdom in this statistic. * Household final consumption expenditure. Includes consumer spending on tourism (UK and foreign), food and drink, clothing, housing, household goods and services, health, transport, communication, education, restaurants, hotels and communication. Figures based on current prices and are seasonally adjusted.